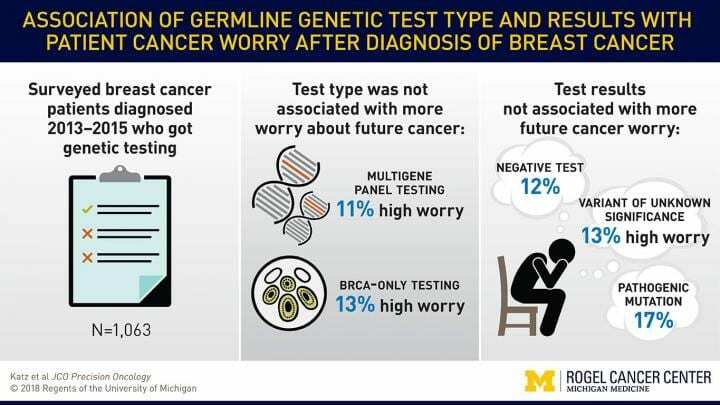 ANN ARBOR, Michigan — As genetic testing for breast cancer has become more complex, evaluating a panel of multiple genes, it introduces more uncertainty about the results. But a new study finds that newer, more extensive tests are not causing patients to worry more about their cancer risk. “Genetic testing is becoming increasingly more complex, but increasingly more precise. This has led to some ambiguity in test results. The challenge is incorporating this information into the treatment decision without causing unnecessary worry,” says lead study author Steven J. Katz, M.D., MPH, professor of general medicine and of health management and policy at the University of Michigan. Initially, genetic testing for breast cancer focused exclusively on BRCA1 and BRCA2 genes. Now, newer multigene panel tests look for abnormalities in a dozen or more different genes that play some role in breast cancer risk. By testing more genes, it’s more likely a patient will have a positive test or a variant of unknown significance – in other words, something is out of the ordinary but doctors do not know how that impacts cancer risk. The concern is that this greater variation could lead patients to worry too much about their risk of breast cancer recurrence when the genetic testing results are ambiguous. Researchers surveyed 1,063 women treated for early stage breast cancer who had received genetic testing between 2013-2015, the period in which panel testing became more popular. About 60 percent of the patients were tested only for BRCA1 and BRCA2, while 40 percent had the multigene panel test. Patients were asked how much and how often they worried about their cancer coming back and the impact that worry had on their life. Overall, 11 percent of patients reported that cancer worry had a high impact on their life and 15 percent worried often or almost always. Neither the impact nor the frequency of worry varied substantially based on the type of genetic testing or the test results. The study is published in JCO Precision Oncology. Virtually all of the patients surveyed received some form of genetic counseling.